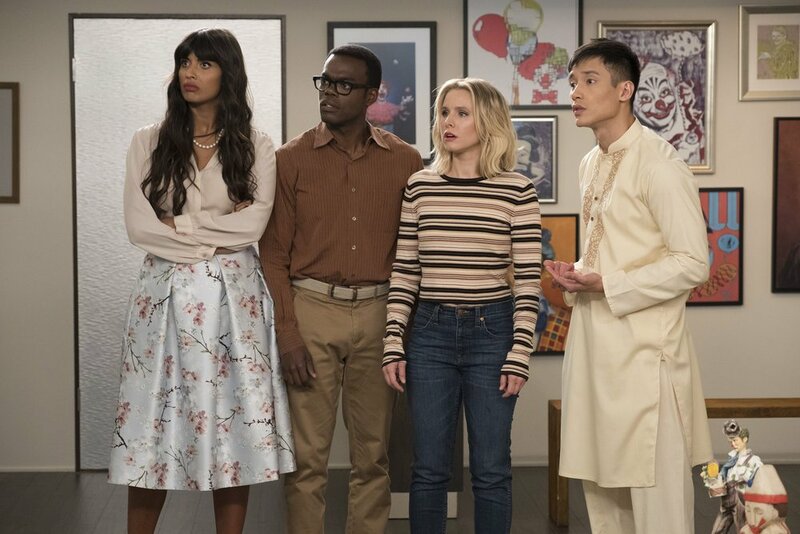 I have been really impressed with the serialized storytelling of The Good Place so far, but the ending of the one-hour season premiere concerned me about where it's going from here. Now, the time has come for the timeslot premiere. The episode begins with hundreds of attempts at creating a fake "Good Place", but each time Eleanor figures out that they are in the Bad Place, aside from one hilarious time when Jason figures it out. The funniest part of all this though is Janet's pleading for her life every time she has to be rebooted. My biggest concern coming into this week is that Eleanor and the group have no clue to get them started and that everything they did in season one was all for nothing. However, it turns out there is one thing unaffected by the reboots: Mindy St. Clair. That's why I was relieved to find out that the Medium Place is real, and not just part of this fake "Good Place". One fun part of the season premiere was getting to see the actors as themselves, and Vicky is back and being great again this week. The actors have gone on strike, and Vicky is representing them. She is really funny, and she tells Michael that she wants to run the neighborhood. I wish we got more of this, but there was a lot of story the episode had to cover. The ending to the episode, where the four are going to team up with Michael, is surprising, and holds a lot of potential. I am extremely excited for next week, and I don't know who couldn't be with that ending. The brilliant Michael Schur has a plan, and the exact right amount of it was revealed this week. The beginning of the episode with all of the repetitiveness went on a bit too long, but after that the episode was excellent. The episode went by quickly, but a lot was fit into it. Next week should be great as well! What did you think of "Dance Dance Resolution"? Leave your thoughts in the comments!